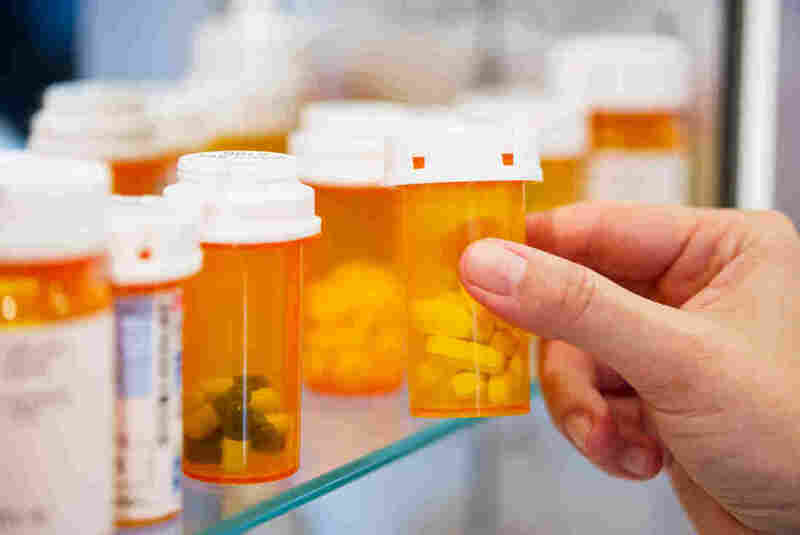 More Marketplace Health Plans Ease Access To Some Expensive Drugs : Shots - Health News Complaints from patient groups and increased regulatory oversight appear to be leading to changes in the way some marketplace health plans cover expensive drugs. If you need to reach for a top-shelf medicine, some marketplace plans are making it more affordable. Some people with cancer, HIV and multiple sclerosis have better access to high-cost specialty drugs in marketplace plans this year, yet a significant proportion of these plans still place many expensive drugs in cost-sharing categories that require the highest patient out-of-pocket costs. The report released Tuesday by Avalere Health, a consulting firm, examined how silver-level plans handled 20 classes of medications that are used to treat complex and expensive diseases such as HIV, cancer, hepatitis C and bipolar disorder. Health plans generally place covered drugs into tiers. Generics and preferred brand-name drugs are in lower tiers with lower cost sharing, while higher-priced drugs are often placed in tiers that require patients to pay a percentage of the cost of the drug rather than a flat copayment. The study found that for five classes of drugs — two used to treat cancer, two for HIV and one class of multiple sclerosis drugs — fewer plans in 2016 placed all the drugs in the class in the top specialty drug tier with the highest patient cost-sharing requirements or charged patients more than 40 percent of the cost for every covered drug in the class. For example, in 2015, 57 percent of silver marketplace plans put all cancer drugs called anti-angiogenic agents (which inhibit the growth of blood vessels) in the top specialty tier. In 2016, that dropped to 50 percent. Last year, a quarter of silver plans charged patients more than 40 percent coinsurance for every drug in that class. In 2016, 15 percent of such plans did so. Likewise, 14 percent of 2015 silver plans placed protease inhibitors, a class of HIV drugs, in the top tier, compared with 10 percent in 2016. The percentage of plans charging more than 40 percent coinsurance for those drugs dropped to 6 percent in 2016 from 9 percent the previous year. The changes are likely driven by protests and legal challenges from patient groups and from increased regulatory oversight, said Caroline Pearson, a senior vice president at Avalere. For example, California next year will prohibit insurers from placing most or all of the drugs for a specific condition in the highest cost tier. In addition, the federal Department of Health and Human Services has signaled in guidance to insurers that placing all or most of the drugs in a high-cost tier may be discriminatory. "There's been a lot of discussion about discriminatory drug benefits, and that attention has moved health plans to make changes," said Pearson. Carl Schmid, deputy executive director at the AIDS Institute, an advocacy group, said of the study results: "It does show some progress, which we are pleased to see." The organization drew attention to the problem in 2014 when it filed a complaint with the Office for Civil Rights of the federal Department of Health and Human Services charging that the plan designs of four Florida health plans were discriminatory because they discouraged people with HIV/AIDS from enrolling. The Florida Office of Insurance Regulation subsequently set maximum limits on cost-sharing for HIV medications in marketplace plans. "We can celebrate this," Schmid said, but "our goal is zero, there should be no plans" that place all the HIV drugs in a class in the top tier and charge high coinsurance. Please contact Kaiser Health News to send comments or ideas for future topics.